Senegal midfielder Mustapha Bayal Sall has been handed a four-month ban by Fifa for signing for two clubs at the same time. The 22-year-old signed for Norwegian side IK Start in March last year but never played for his employer. 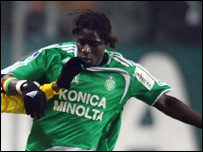 He joined French club St. Etienne three months later after impressing on trials. Fifa has ordered St. Etienne to pay a US$150,000 compensation to IK Start and Sall's ban will start from next July. This means he will be available to play for his country during the Nations Cup in Ghana in January. St Etienne have taken the matter to the Court of Arbitration for Sport (CAS).